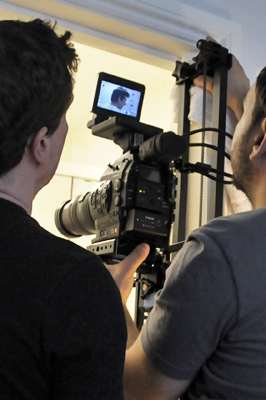 We recently rented Kessler’s Shuttle Pod Mini and elektraDRIVE bundle for a short film shoot (Life & Death, Directed & Produced by XAv Rodriguez, DOP’d by Daniel Fazio, starring Keith Eyles), it’s a great piece of kit and a fun ‘toy’* so we thought we’d share our experiences of it. (*all film kit is ‘toys’ to us :). 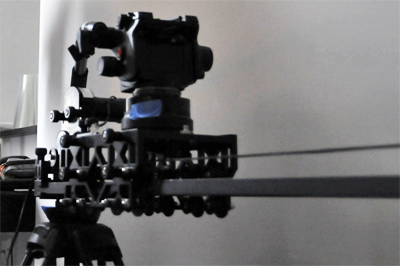 Kessler Crane based in the US make a wide range of camera supports, sliders, jib arms and accessories, they’re products are well known on the indie circuit for their build quality and professional results, it's a trusted name with great customer service. 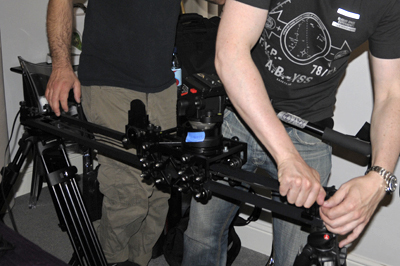 We’ve played with the Kessler Crane Philip Bloom Pocket Dollies many times (a simple straight forward slider which easily out classes anything it’s range), we knew therefore that the Shuttle Pod Mini would be good. Easy. No instructions necessary really though a picture of what it should look like helps. All the components fit easily and snuggly, you can have the carriage built and mounted on the rails in a matter of minutes. The carriage has 16 wheels in total - 8 wheels on each side of the carriage, 4 above and 4 below each rail locking it on - it fits perfectly to the rails first time and rolls smoothly straight away. The rails are just 2 bits of 4ft long square tubing but do the job well. Bit fiddly - instructions are definitely required! There are lots of components which need to be connected up together - on the carriage, attachments either end of the rails, tensioning the belt, motor into the belt, etc. Once you know what you’re doing its fine, the first time is a little bit more complicated, allow 10mins+ first time. The Shuttle Pod we rented comes with the Kessler All-Terrain Outrigger Feet (http://www.kesslercrane.com/product-p/allterrain_outrigger.htm), great build quality, easy to attach but we didn’t use them – at only about 8” long (estimate) they were too short for our uses, they’re very versatile but we wanted to shoot a few feet off the ground and above. Instead we used two Manfrotto tripods to support the slider, while this takes a lot more time to set up we were able to get the heights we wanted and keep the unit sturdy. When using the slider vertically however we had to improvise using a side table, some bathroom towels to protect the table / walls and our hands to support the unit – this worked well though and results were very good. One thing I would add however there are a lot of Kessler support accessories available that are not included in the standard package which are very useful / essential for various set ups, some of the tripod mounted and vertical configurations we set up would not have been possible without having some of our own bits of kit on set already. The carriage and components are robust and well machined, and they assemble quickly, easily and solidly, it’s a well thought out and engineered piece of kit. The only slight design flaw if any would be the end of rail fasteners are a bit too close to the dove tail belt fasteners, so sometimes you have to loosen a rail faster an 1/8th turn to be able to mount the belt fasters properly – very minor detail really. The carriage is virtually silent when it free rolls, superb! One thing we found however, unless the carriage is properly bubbled (levelled) the unit can sway a little forward and back, levelling it correctly seems to eliminate this - we did have a medium size camera with heavy lense on it. Build quality is great, being a box of electronics with a screen, buttons and joystick it’s build to last, it’s not as fragile as you would expect from such a device. The motor likewise was solid, however it has a really short Ethernet cable connection – an extension cable (supplied in our rental kit) was definitely useful. 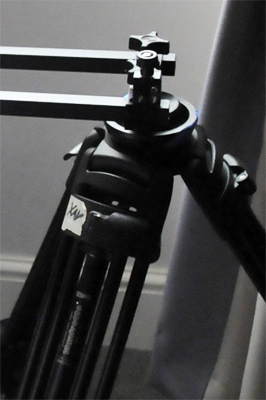 The drive belt appears as toughened rubber but we’re guessing is reinforced very sturdily – we has the unit vertical with a C300 + pro lenses, although it stretched slightly in this position we had confidence it would not snap. That said, with £13,000 of kit on it we did make sure we placed a hand directly underneath the camera at all times just in case as the entire weight of camera, lense and carriage was going through the slim belt! This is a very versatile controller with a lot of options, perhaps too many!? We just required a basic set up - to be able to control speed and damping (the amount of time it takes to get to full speed / to rest for smooth start stops). Fortunately this located at the top of the menu system, however as the screen is old skool style which makes navigating to the uninitiated confusing – when we accidently got lost we just unplugged the power cable and back in again which reboots it. We didn’t try programming it to do anything fancy (timelapse, programming buttons, etc), that would involve reading the very long manual and wasn’t what we were after. Instead jump on Kessler website and check out the excellent videos on it, this should give you enough info to get you up and running. For power, the Oracle Controller (which also powers the motor) comes with a mains plug unit and large, heavy battery in a padded case – we opted for the battery for the shoot as it would be easier to move around, through the shoot we never ran out of charge and the battery weight / size was never an issue. 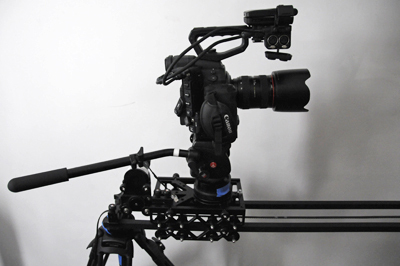 This is what it’s all about, any slider worth its weight in gold MUST have silky smooth motion and full control of the tiniest minutae, without judder or uneven speed changes – and this set up does this perfectly! Simply push the joystick one way or the other and great shots come out the other end, it does not disappoint. You can control the speed, damping and much more, you can get it to do easily and controllably what you want and elegantly so. We like! That said, when positioning the Shuttle Pod vertically (are we even supposed to do this!?) sometimes it didn’t like this and we would get the occasional judder at similar intervals which ruined the shot – perhaps the bit of stretch in the belt means the teeth don’t line up perfectly under vertical conditions, we were unable to pin the cause down specifically given our busy shoot days however usually fiddling with the belt tension and re-sitting the motor sorted it back to super smooth. Impressive! These motors are available from Kessler in different speed / torque gearing guises, the standard ones are Series 100, 200, 500 (500 being the torquiest and slowest, there’s also two speciality motors at either end of the spectrum, a 50 and a 1000). We had the 500 series motor, don’t be fooled by its appearance (size and shape of a bicycle handle) it packs a lot of power. 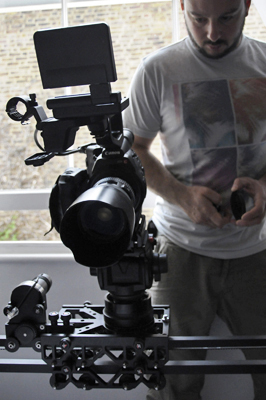 We had the Shuttle Pod Mini loaded with a Canon C300 and a variety of heavy pro lenses but it never struggled at all. Sure, you might think it’s a slider moving horizontally of course it won’t struggle... well we also flipped it 90 degrees to run vertically! Despite this it never struggled up or down with the weight, fully loaded. We did find however the belt / roller connection (we think) was the Achilles heal, it would judder occasionally and ruin the shot – usually a bit of belt adjustment would solve however. Speedwise, perfect for our needs, very slow to a slow medium speed, usually with these types of shots that’s exactly the speed you want. It can apparently also so micro slow speeds, like year-long timelapes. If we were to buy a unit I think we’d go for the 500 Series motor, although we havn’t tested the others. An important point to note, as you would expect it’s not silent so if using for indoor scenes the motor noise will definitely pick up on your audio. Lots of various accessories are available for the unit such as ball heads, angled mounting brackets, etc, many of them are crucial to various setups and available as options when you buy - don’t expect everything to be in the box. It’s therefore worth thinking about how you want to use the Shuttle Pod and what accessories you will need. The Kessler Crane Shuttle Pod Mini with Oracle Controller is a superb piece of kit for small productions and semi pro film makers, we will definitely rent one of these again, however the purchase price is too high to justify unless we were using it very often. Kessler kit tends to be expensive, the quality is absolutely there but you definitely pay for it - unfortunately this puts us off buying all but the most needed items, else we would be buying much more! Renting is certainly a sensible option. Using the Shuttle Pod Mini with a DSLR it would be fantastic, with something a little bigger and heavier like the C300 it is still excellent, however not sure we’d stick anything bigger on it... another test perhaps ;) One improvement we would suggest however is a bigger screen / better interface to aid menu navigation. Bottom line, we love it, top quality and versatile product which adds production value for cheap rental price, 8/10!